Looking for top quality, custom screen printing and embroidery at the best prices in the Phoenix Arizona area? You have come to the right place. 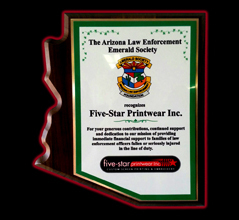 Since 1993, Five-Star Printwear, Inc. has been providing custom t-shirts, superior custom silk screening, and custom embroidery at wholesale prices. From international companies to local businesses; from schools to clubs; charities and indviduals; your business is important to us and we are eager to serve you. Click Here to learn more about our company and our staff. Get a custom quote for exactly what you want; online, in minutes. Click the big red button and go directly to our online catalog. You will find a wide variety of garments, hats, and other imprintable items. Choose the item that you want, plug in the color of the item, number of colors in your design (logo), and the number of items in each size that you want to get your custom quote.